The events unfolding after the Iranian election called the world's attention to the power of social media. Everything started with an election that is said to have been rigged. 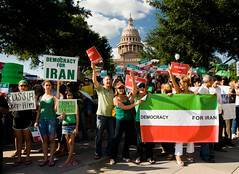 The opposition to the Iranian government protested and protestants took the streets and traditional media was censored. What followed next was a flood of news from social networks. Iranians used twitter , facebook , and youtube to post videos and text updates about the protests and the violence that the government forces used to deal with it. Some international news commentators said some Iranians did not even know that their posts or videos were being read and watched all over the word. So, for many of them it represented the discovery of a new way of voicing their protests, of informing the outside world of what is happening in their country. The power of uncensored, unfiltered information is just huge and it is sometimes difficult to understand why some educators still resist using social media to connect their students. I´m still "struggling" to get around the digital world and that´s why this is my first post to one of your great digital creations. I always access the work you´ve been doing because you have helped me a lot with "how to do and what to do" and I´m deeply grateful to you. The news you have posted is essential to showing us the new and poweful uses for social networking. I´m really relieved to realize that social networking empowers people to protest and express their beliefs, which means that in fact there are people interested in listening to us. Thank you for that!! What a wonderful surprise to hear from you. I am really glad to know I have been able to help you. Please do not hesitate to ask for help if you need any in your efforts to get around the digital world. I am sure we can harness the power of social networks to learn more.